From These Hands, was released at the Phillips Exeter Academy library on August 5th, 2004. From These Hands is a collection of Irish tunes, songs, and poetry. The title for the CD reflects how artists and ﻿musicians﻿ use their hands. This led to the collaboration with potter Kit Cornell and fabric artist Tinka Pritchett. Their works grace the CD cover and the artistry of photographer Barry Meehan pulled it all together. Joining me on the CD ﻿are ﻿local﻿ musicians Claudia Altemus, Eugene Durkee, Mike Serpa, Bill Thomas, Rodney Miller, my sisters Julie and Mara, and my daughter Alanna. The collection includes slow airs, lively jigs and reels, barndances, songs and a haunting poem. 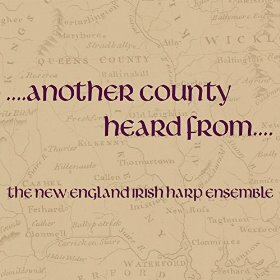 The Ensemble members of The New England Irish Harp Orchestra have put together a collection of dance tunes, slow airs and ballads arranged for six harps. Plus a bonus track at the end. This is Réag﻿ánta's secon﻿d CD with a collection of lively dance tunes and soulful ballads. Joining us on this CD is Eugene Durkee on guitar and Chris Murphy on bodhran. Capturing the many forms of Irish performing, "Nollaig" brings them together for the Christmas holiday. Instrumentals, songs, dance and storytelling are all wrapped up in one Christmas package. The instrumentals highlight the sweet sounds of the harp and whistle together. Finishing the CD is Claudia's beautiful telling of the traditional Irish story, 'The Christmas Cabin of Carneween'. Music and song are artfully weaved together throughout the story transporting you to a magical place for the holiday season. Songs of the Seasons: This is a compilation CD produced by the N.H. State Council on the Arts. It features many NH artists performing the songs of their cultures, including Polish tunes and carols, French fiddle ﻿songs﻿, Spanish villancico and aguinaldo, music about New ﻿England﻿, and, of course, Irish harp music and song.